This magnificent bridal ring set from the Miadora Collection features an engagement ring with a round-cut white diamond center stone surrounded by a halo of smaller round diamonds and additional diamonds along the split shank band. 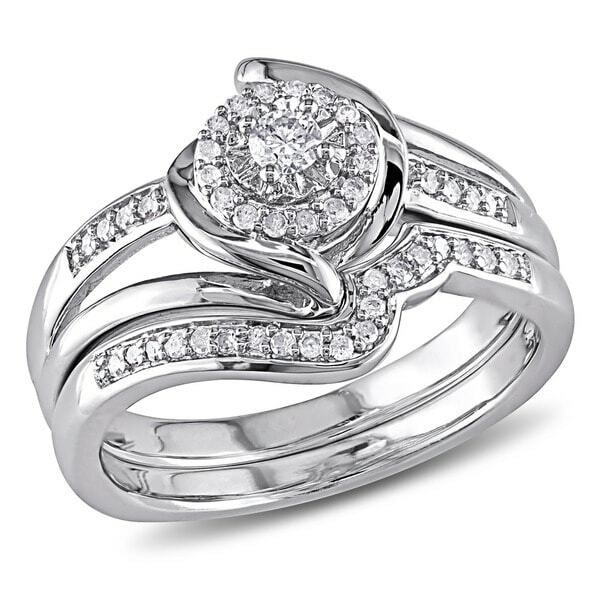 This lovely wedding ring is complemented by a contour diamond studded stackable wedding band. The classic and sophisticated gleam of silver makes this wedding set as durable as it is lovely, ensuring that this bridal set lasts a lifetime. My first wedding ring sadly lost its diamond so I was on the market for a lower priced but high quality ring. This met my needs entirely. The best part It fits perfectly. I picked this bridal set out myself and love it. 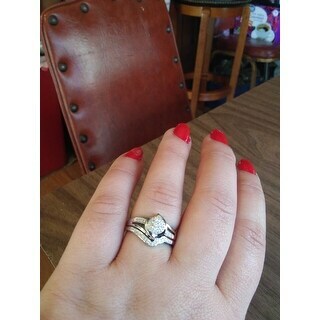 I get so many compliments about it, and the best part is i dont have to stress about having a 3000 set on my finger. doesn't look fake at all. although a 1/4ct, looks larger because of surrounding diamonds. I have a problem with losing rings. So my real bridal set remains in the safe deposit box. Very nice design, but middle stone fell out after a few months of wear. Metal that was holding stone sticks out and gets caught on things. Stopped wearing it. My husband purchased this ring set for our wedding. It came quickly and is absolutely stunning! 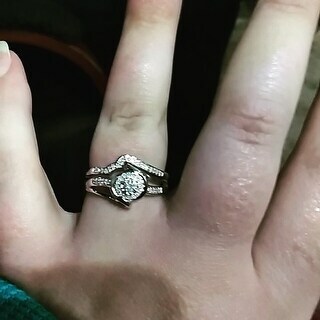 I was so impressed by the ring once my boyfriend put it on my finger. I got so many compliments at my job and everywhere I go. It is so pretty and it stands out. It is truly a classy ring and worth the price. I am very happy! I've had this ring roughly a month and it's turning my finger colors! I LOVE my set!! When the sun hits it, absolutely beautiful. Upgrade a little later, but perfect starter set. Beautiful ring. Unique setting. Perfect for the price. Love it! It arrived earlier then was stated. Fits wonderfully. Loved my ring. Simple and perfect. "Is thus band sold separately"
No. The band comes with the set. "Can the rings be soldered together.or do they stay together by themselves "
Set is sold together or with a separate band; band: 19488060. "Hi I have this set and have lost the band part :( is it possible to just order the band?" Unfortunately this band is not sold separately. "Does the band come apart from engagement ring so i can just wear as an engagement ring till i get married. There is no pic showing that they come apart." "why can't it be resized?" Hello grapplincoach71, silver cannot be resized, but gold can. Thank you for shopping with us. "does it come in size 11.5???" Hello gabrielg946, we do apologize, this item is not currently available in a 11.5. Thank you for shopping with us. Because it contained diamonds and was made from Sterling Silver as I wanted. 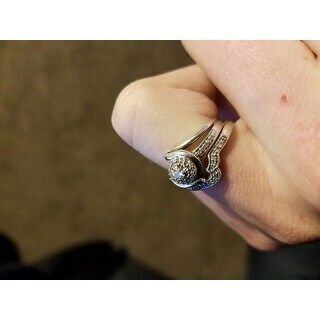 The price was perfect and the design is unique so I shouldn't have a ring set another woman has.